Rajni Kumar (formerly, Nancie Joyce Margaret Jones) was born in England on March 5, 1923 to British parents. Even as a young adolescent, she felt deeply concerned about the rise of fascist Europe, colonialism and racial inequality in Asia and Africa, and the sufferings caused by World War II. Not surprisingly then, during her college years she became an active part of the anti-fascist movement. During this time, she also joined the India League and the India Relief Committee for the sufferers of the Bengal famine. At 23, she left England and her family to join her fianc' Yudhishter Kumar, a co-student. In India, Kumar identified with the Indian freedom struggle. She wore Indian clothes made of thick khadi and felt it would be appropriate for her to take on an Indian name; hence Rajni. Fittingly, it was in India that she found her true calling and started her visionary and pioneering journey in education. For five years - from 1950 to 1955 - she set up and ran a Hindi-medium school under the Salwan Educational Trust for girls from families displaced by Partition. They needed not only education but also a sense of security, love and morale boosting, and they received all this in full under Kumar's care. For Kumar, the reward was in seeing them taking their place in the world as self-confident, young women. She recalls: "Through these Punjabi girls and their displaced families, I was brought face-to-face with the harsh realities of life: how lives can be shattered overnight, and how people find the resilience and the courage to pick up the threads and build their lives anew. I marveled at it. Education was their lifeline for tomorrow. And working together, we forged lifelong friendships that endure even today." In 1952, Kumar lost her son. Heartbroken, she immersed herself in work. 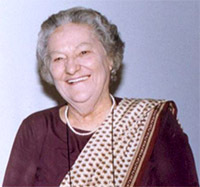 She joined the first delegation of Indian women as founder-member of the National Federation of Indian Women to attend the World Congress in Copenhagen in 1953, and thereafter for a six-week tour of the Soviet Union, meeting women who had suffered the ravages of war and were involved in the process of reconstructing their country. In 1953, the Kumars were blessed with a daughter, bringing them much joy and comfort. After five years as principal of the Salwan Girls School, Kumar decided to start a school of her own, which would provide students with a different, more refreshing atmosphere. After all her years as an educationist, Kumar was brimming over with fresh and exciting new ideas on education. And so, on September 1, 1955, Yudhishter Kumar's birthday, Springdales School was born in Kumar's own home as a small kindergarten with 24 tiny tots as the entrants. She ran the school as founder-principal for 32 years and worked untiringly with vision and a sense of mission to build up the school of her dreams and cherished beliefs. In this, her husband, his family members and many like-minded co-workers who had been in the Indian struggle for freedom supported her. Today, over 5,000 students benefit from the unique educational experience the school gives. Springdales provides for compulsory community service for students; has international friendship clubs and linkages; set up the Africa Club in 1971 to support the anti-apartheid movement in South Africa; introduced peace education and human rights education as part of the curriculum; set up the "Adopt a Gran" project with HelpAge India; and was the first school in the country to partner with deprived children in State-run schools under the "twinning programme". In fact, in recognition of the sterling role played by the Africa Club of Springdales, the government of South Africa felicitated Kumar on International Women's Day 2005. Yudhishter Kumar, Kumar's greatest source of support, died in 1976 of cancer at the age of 59. His death left a void in her life and in the institution they had been building together. She took this second blow in her life with fortitude. During this period, apart from her educational work at Springdales and her work in higher education as chairperson of the Lady Irwin College for 11 years, she actively engaged herself in the world peace movement. She took part in the Global Peace Conferences in Geneva, the World Congress for the Rights of Children in Moscow and in peace journeys through the Soviet Union, Hungary, Czechoslovakia and Austria. As vice-president of the National Bal Bhavan, she initiated many programs to bring creative learning experiences and joy into the lives of deprived children, setting up many Bal Bhavans in different states of India. Former Prime Ministers Jawaharlal Nehru and Indira Gandhi had visualized the concept of Bal Bhavan - children's houses of culture - to give children from all strata of society an opportunity to express themselves through recreational activities: theatre workshops and other cultural activities, and science and sports programs. Kumar recalls how thrilled children were to be at the National Integration Camps, sleeping away from home and mixing with children from different states. She retired in 1988 at the age of 65 and since then she has been actively engaged in education as the chairperson of the Springdales Education Society. Kumar also became the voluntary coordinator of the Delhi Schools Literacy Project under the National Literacy Mission, inspiring and motivating the students and teachers of over 60 schools to actively involve themselves in eradication of illiteracy. During the last 16 years, they have made literate over 80,000 learners and are now motivating the neo-literate from 22 slums and bastis to continue their learning and earning programs. Kumar has also spoken out strongly against communal politics, saffronization of education, distorted textbook materials and rightwing ideologies. The open conflict with those in power has often made her personal and professional life difficult. There have been threats and harassment. None of this has ever deterred her from acting in accordance with the dictates of her conscience. Her vision for the future is to find ways to make the educational systems more humane, equitable and relevant to the changing world scenario, using technology for linking schools and youth globally.